The human WIG-1 gene is involved in the p53 dependent growth regulatory pathway. 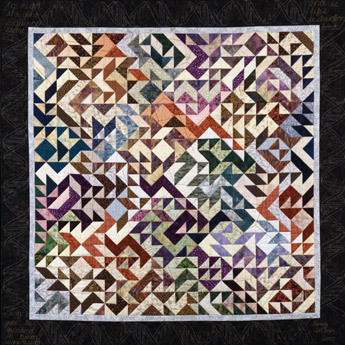 “The activity of the p53 tumor-suppressor protein has a key role in controlling both cancer and aging; underactivity encourages the growth of cancer, and overactivity can accelerate the aging process.” (Lane, D. Curing cancer with p53. New England Journal of Medicine 2004; 350; 26: 2711-2.) 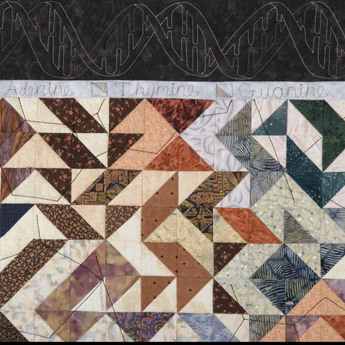 Part of the WIG-1 gene’s DNA sequence is encoded in the triangle blocks, which are then quilted to show the molecular structure of DNA. 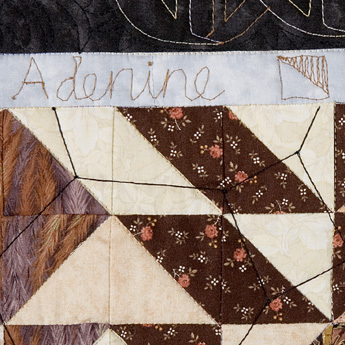 The border quilting includes explanatory text and a double helix design.